Whether you own a car,house ,building or professionally involved in operation and maintenance of machines, you need to know some basics about maintenance. Some form of maintenance you are practicing already but you always need to re-look at maintenance program so that you keep your asset(s) in correct form with minimal cost. Maintenance is not only “the restoration of any asset to function after it has failed “instead spectrum of maintenance is broadened now. This post covers the basic maintenance types with special focus on following topics related to maintenance Programs. In general, Maintenance means to hold, keep, sustain or preserve the building ,machine or structure to an acceptable standard. Maximising production or increasing facilities availability at the lowest cost and at the highest quality and safety standards. Reducing breakdowns and emergency shutdowns. Improving equipment efficiency and reducing scrap rate. Optimizing the useful life of equipment. Providing reliable cost and budgetary control. Identifying and implementing cost reductions. 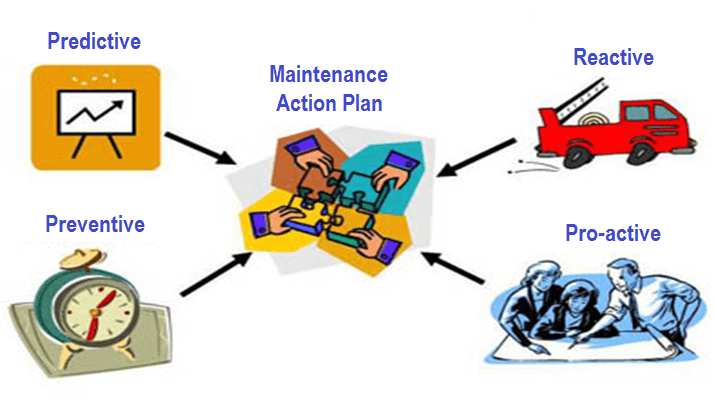 Different types of maintenance are being practiced in various parts of world.Adoption of particular Maintenance type greatly depends upon the resources of organization or company.One maintenance approach may cost less than other so each professional has to see the resources and then decide for “which maintenance type is best for his plant”. Reactive maintenance is basically the “run it till it breaks” maintenance mode. No actions or efforts are taken to maintain the equipment as the designer originally intended to ensure design life is reached. Advantages to reactive maintenance can be viewed as a double-edged sword. If we are dealing with new equipment,we can expect minimal incidents of failure. If our maintenance program is purely reactive, we will not expend manpower dollars or incur capitol cost until something breaks. Increased cost due to unplanned downtime of equipment. Increased labor cost, especially if overtime is needed. Cost involved with repair or replacement of equipment. Possible secondary equipment or process damage from equipment failure. Preventive maintenance frequency may be machine operating hours based or after fixed time interval as decided by maintenance engineer or recommended by vendor of machine. Cost effective in many capital intensive processes. Flexibility allows for the adjustment of maintenance periodicity. Reduced equipment or process failure. Estimated 12% to 18% cost savings over reactive maintenance program. Catastrophic failures still likely to occur. Includes performance of unneeded maintenance. Potential for incidental damage to components in conducting unneeded maintenance. Predictive maintenance can be defined as follows: Measurements that detect the onset of a degradation mechanism, thereby allowing causal stressors to be eliminated or controlled prior to any significant deterioration in the component physical state. Results indicate current and future functional capability. Basically, predictive maintenance differs from preventive maintenance by basing maintenance need on the actual condition of the machine rather than on some preset schedule. You will recall that preventive maintenance is time-based. Activities such as changing lubricant are based on time, like calendar time or equipment run time. For example, most people change the oil in their vehicles every 3,000 to 5,000 miles traveled. This is effectively basing the oil change needs on equipment run time. No concern is given to the actual condition and performance capability of the oil. It is changed because it is time. This methodology would be analogous to a preventive maintenance task. If, on the other hand, the operator of the car discounted the vehicle run time and had the oil analyzed at some periodicity to determine its actual condition and lubrication properties, he/she may be able to extend the oil change until the vehicle had traveled 10,000 miles. 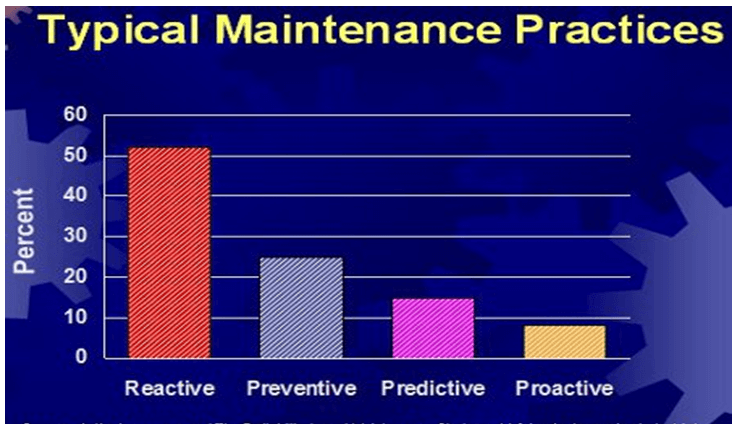 This is the fundamental difference between predictive maintenance and preventive maintenance, whereby predictive maintenance is used to define needed maintenance task based on quantified material/equipment condition.The advantages of predictive maintenance are many. A well-orchestrated predictive maintenance program will all but eliminate catastrophic equipment failures. We will be able to schedule maintenance activities to minimize or delete overtime cost. We will be able to minimize inventory and order parts, as required, well ahead of time to support the downstream maintenance needs. We can optimize the operation of the equipment, saving energy cost and increasing plant reliability. Allows for preemptive corrective actions. Decrease in equipment or process downtime. Decrease in costs for parts and labor. Improved worker and environmental safety. Estimated 8% to 12% cost savings over preventive maintenance program. Increased investment in diagnostic equipment. Increased investment in staff training. Savings potential not readily seen by management. The latest innovation in the field of predictive maintenance is so-called pro-active maintenance, which uses a variety of technologies to extend the operating lives of machines and to virtually eliminate reactive maintenance. The major part of a pro-active program is root cause failure analysis, which is the determination of the mechanisms and causes of machine faults. The fundamental causes of machine failures can thus be corrected, and the failure mechanisms can be gradually engineered out of each machinery installation. It includes routine preventive and predictive maintenance activities and work tasks identified from them. It has been known for a long time that imbalance and misalignment are the root causes of the majority of machine faults. Both of these conditions place undue forces on bearings, shortening their service life.Rather than continually replacing worn bearings in an offending machine, a far better policy is to perform precision balance and alignment on the machine, and then to verify the results by careful vibration signature analysis. 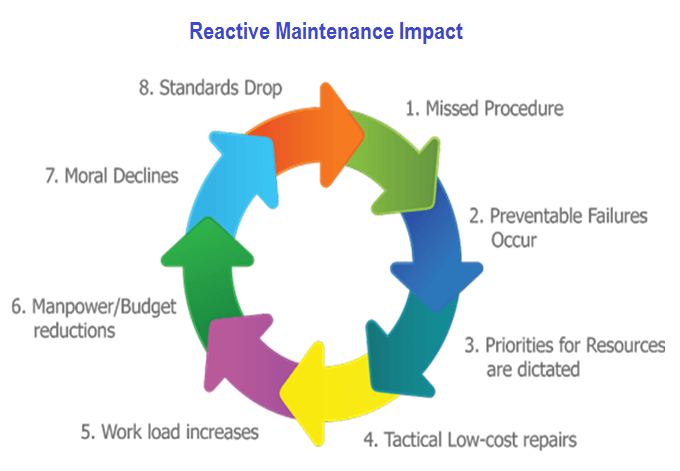 Among above maintenance types, Proactive maintenance programs has privilege of having advantages which are sum of advantages of each of reactive maintenance ,preventive maintenance & predictive maintenance program.While it shares its disadvantages mostly with predictive maintenance program. Predictive maintenance is the technique to determine the condition of machine by sensing, measuring tools etc. Example- Suppose one fan having abnormal vibration that find out by sensing tools (vibrometer etc. ) and we attend the job and rectified the current problem in fan. but in proactive maintenance , we search-out the main cause of the problem, which may, design problem, weather problem, operation problem etc, that to solve the actual problem. you are doing a wonderful job.I have enhanced my career through your articles. I have a question for you that what is constant head pressure chamber in boiler drum level measurement.